How do you know if your Heat Siphon is an ANALOG MODEL? Suppose you just bought a house and it has a pool and you see this Heat Siphon which you would like support on but don't know what type or model it is? First look at the front - if your Heat Siphon has a KNOB instead of a digital display - it's ANALOG. Look at the nameplate for the model number and if it DOES NOT START WITH A "D" then it's ANALOG. Newer ANALOG models like the one pictured to the left look a lot like the Digital models. They have the same gray cabinet and the doors are the same, with a blank door in the upper left covering the digital control pocket, and just below that door a larger door with a knob in the lower right coner. Older analog models may have an almond color PVC cabinet instead of the new Titanium Gray. They will still have the knob in the same place on the lower right corner of the control box door, but they will not have the smaller door on the upper left as they have no digital pocket. On all ANALOG models the control circuit is wired in series, like a christmas tree's lights from one to the next - ALL control switches must be closed to turn it on like all bulbs must be good to light the tree. If any control is "open" or faulty it will prevent your Heat siphon from starting. Troubleshooting merely involves jumping out each control until the Heat Siphon starts to find the faulty control or the condition preventing operation. Is power on? - it sounds stupid but MANY MANY service calls can be avoided if this simple check is done - Check both your main Circuit Breaker and your Heat Siphon Circuit Breaker. Water flow confirmed from pool through heater and back to pool? sometimes you can hear the water flow though the unit and feel the pump vibration in the piping but in any case check the return for a strong water jet back into your pool. Is breaker tripped? You may have a bad breaker or faulty wiring, loose wires or poor connection in the junction box . Have your installer check the wiring and breaker. NOTE: Some brands of GFI type breakers are extremely sensitive and are susceptible to false tripping. Have your installer check all wiring between the unit and the breaker and make sure the breaker is wired right. Time delay activated by brief power on/off? - Wait 5 minutes-unit should restart. NOTE. The combination of a cold pool (below about 50°F) and a low air temperature (below about 45°F) MAY cause temporary on off cycling of the Heat Siphon®. A pool cover and /or 50°F air temperature will eliminate this cycling and allow normal heating operation to resume. Is the pool filter clean and pool water flow stable? - A clogged filter or air leak in the pool pump return line can cause erratic water flow and air in the lines which in turn can cause Heat Siphon® to cycle- restore the correct water flow. 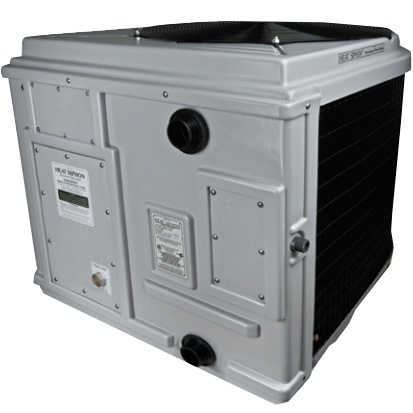 NOTE: If Heat Siphon®’s air outlet is noticeably (5 to 10°F) cooler than the inlet air, then YOUR UNIT IS WORKING PROPERLY AND PROVIDING HEAT TO YOUR POOL. The unit may not have been running long enough to heat the pool, or the unit may be undersized. TEST THE LEAK WATER FOR CHLORINE - capture water coming from HEAT SIPHON and use your pool water test kit to check for chlorine, etc.